This article describes the results of expanding psychological services for veterans being seen in an interdisciplinary pain management program to include 5 choices of complementary and alternative medicine (CAM) approaches at the Michael E. DeBakey Veterans Affairs Medical Center Pain Management Program. Clinics are made available 3 times a week for an hour each on a drop-in-as-needed basis (without the need to make appointment) making it more convenient and accessible to the veterans. The CAM choices were cranial electrotherapy stimulation (CES) using the Alpha-Stim (AS) medical device, 3 biofeedback devices: Stress Eraser (SE), EmWave (EM), Respirate (RR) or an audio-visual entrainment device called the David Pal. 32 veterans participated during the review period. 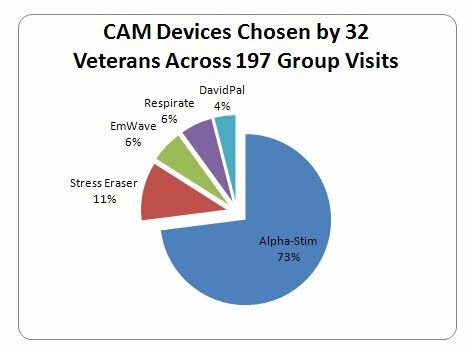 Each veteran could choose from among the 5 CAM modalities and switch to another at any time, however, a large majority (73%) of veterans chose to use AS, followed by SE (11%) down to 4% for the David PAL. Approximately 3 months of pretreatment data was compared with 3 months post treatment data. The vets were asked to complete a self-monitoring form indicating self reported pain ratings and other benefits including sleep, anxiety, depression, and sense of well being before and after the session as well as similar benefits since the last session. Other outcome measures were from 4 assessments: PHQ-2, OASIS, MOS SPI-I, MHI-5. The benefits observed following the introduction of CAM therapies included: improved attendance and veterans’ involvement in group-based therapies, reductions in reported pain and anxiety, improved sleep, and an increased sense of emotional well being in the participants. 32 Veterans participated during the review period, resulting in a total of 197 visits to one or more of the 32 CAM groups offered from 03–01-2009 to 05–22-2009. Among the 5 CAM portable devices made available to the Veterans (the option of switching devices between sessions was permitted), a majority opted for the AS (73%), followed by 11% for the SE, 6% for the EW, 6% for the RR, and 4% for the AVS. The average number of Veterans who attended each CAM group session was significantly higher than the average number attending Pre-CAM groups: CAM average 6.16 (SD = 1.99; range, 2 to 9); Pre-CAM average 2.97 (SD = 1.49; range, 1 to 7); [two-sample t test, t(63) = -7.303, p <.001]. A paired t test indicated an average decrease of 1.02 units (SD =1.10) on the 0–10 Numerical Rating Scale of pain intensity during the study period, which was statistically significant t(196) = -12.99, p <.001, and represented a large effect size of .93. 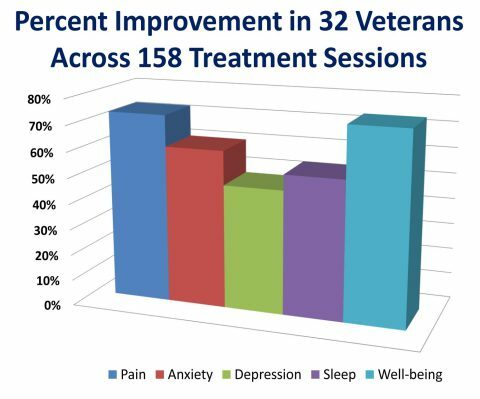 Veterans reported substantial “improvements since last session” especially in pain and sense of well-being (73% and 74%, respectively). “Yes” responses to progress (improvement) were also quite substantial (83% for relaxation, 77% for mood, and 80% for well-being postsession). Monthly administration of a set of 4 brief, standardized assessment tools was used as a supplement to the session rating forms to assess and monitor progress on 4 outcome domains in addition to pain intensity: anxiety, depression, sleep quality, and sense of well being. Statistical analysis was performed using SPSS version 17.0. T-tests examined changes in these additional outcome measures. Although the change scores were not statistically significant, perhaps because of the low sample size, the effect sizes for improvements in well-being, sleep, anxiety, and depression were promising (1.54, 0.73, 0.44, and 0.37, respectively). Hypothesis 1 stated that CAM therapies would be acceptable to Veterans and feasible for clinicians to implement in a pain management program. This hypothesis was supported by results of informal retrospective review by clinicians of the ease of recruiting and enrollment (acceptability to Veterans), and ease of incorporating CAM therapies into the existing pain management program (feasibility). There was little or no obstacle in implementing such a program. The cost for acquiring the CAM devices used currently ranges from $145 for SE to $450 for AS, which is affordable for many programs, especially when considered in light of the costs of other medical equipment and devices. For example, a single nerve block injection for low back pain typically costs around $600.00, including facility and professional charges. Hypothesis 2 stated that adding CAM therapies to the program would improve attendance rates. This hypothesis was also supported. The average CAM group attendance per session was shown to be significantly higher than the average group attendance per session during the 3 months Pre-CAM period (6.20 vs. 2.97 participants per group, respectively). Hypothesis 3, which states that adding CAM therapies reduces pain intensity ratings and improves quality of life among participants, also received preliminary support by the findings. Along with acceptability, results indicate that the CAM therapies used in the MEDVAMC program show promising levels of efficacy as an alternative or additional treatment modality in a group setting. For example, the reduction in reported pain intensity among the CAM participants as a group was modest but statistically significant, with a Cohen’s d of .93. In addition to pain reduction, Veterans who participated in the CAM therapies also reported improvements in a number of quality of life measures. Specifically, the Veterans reported an average improvement (at the end of each session) as follows: 83% for “relaxation,” 77% for “mood,” and 80% for “well being.” When asked to rate “improvement since last session” of treatment across a variety of symptoms, a sizable portion of the participants answered “yes,” especially with respect to pain and sense of well being (73 and 74%, respectively). When standardized assessment tools were used as a supplement to the session rating forms to examine differences in scores between assessment periods 1 and 3 (roughly 2 months apart), the results indicated that, although the change scores were not statistically significant, perhaps due to the small sample size, the effect sizes for improvements in well-being, sleep, anxiety, and depression were promising (1.54, 0.73, 0.44, and 0.37, respectively). Clearly, the Veterans who received the CAM treatments felt that these treatments were beneficial and helpful. These findings indicate that the CAM therapies could be easily incorporated into a traditional pain management program. Perhaps the greatest potential benefits of the CAM therapies presented in this paper lies in the observation that the CES and the SE could potentially be used as a form of self management which could be combined with other psychological interventions such as CBT. Furthermore, these devices are relatively inexpensive, require minimal training to use and could be self-administered at home by the veterans without having had to come into the VA. Given the observation that veterans require very minimal instruction to use the devices, the CAM modalities could probably be used to provide self treatment at home; thus increasing the accessibility of effective treatment to those residing in rural settings or where the cost of frequent traveling to the VA is an obstacle. Finally, unlike other psychological treatments, the CAM modalities appear to have minimal stigma and have more face validity to the veterans. This is a particularly notable for the OEF/OIF vets who have shown very high no-show rates and avoidance of mental health type of treatment for which psychological services are identified as indicated.